In our last BreakAway BreakThrough post, we went back to school. Awwww!?! Now that THAT routine is running as smoothly as a champion football team, here are some ways to escape the grind and embrace fall’s groove. Watch the waterfowl; stroll along a lake and listen to the loons and friends as they make their way south (lucky ducks!). Don’t just jump in the leaves, create a comfy pile and chill there a while. On a sunny day when color is peaking, drop everything and ride right through it. Head to the farmer’s market and marvel at the bounty; maybe make and freeze up a big batch of red sauce so you can taste the sunshine in tomatoes and peppers all winter. Catch a falling leaf, maple-tree helicopter, or star. Walk in the woods—alone or with a favorite friend or pet—without your favorite digital devices. Host a big, fat bonfire and roast savory sausages and stuff on sticks. 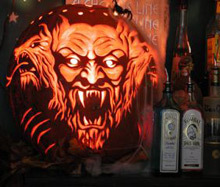 Let the face find you and carve life into some pumpkins. Forgot to make your summer BreakAway? It’s NEVER too late: Take a fall vacation or even a staycation. When Indian summer hits, dig out the shorts and soak up some sun—since it may be many months before that sweet, sweaty feeling arises again. Cold coming? Do your Emergency Coziness Preparations by stocking up on firewood, candles and cognac (or hot chocolate).